Stanley Yelnats is an overweight teenager and a victim of bullying when a pair of old sneakers belonging to a famous sports person falls from the sky. He brings them home to his father who is working on a plan to recycle old sneakers. This sounds pretty normal except a curse started by his great great great grandfather has followed his family for generations (or so they believe). They are sometimes at the wrong place at the wrong time. Stanley is arrested for stealing the sneakers and is sent to a horrible detention home posing as a camp for boys. There he is forced to dig a hole 5 feet deep by five feet wide every single day in the blazing sun. His problems are intensified when he must learn to deal with bullies there too, not only from his peers but also from the sadistic adults. 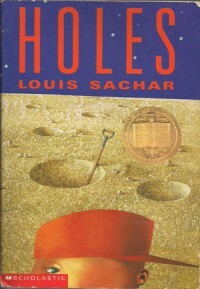 In his middle-grade story, Holes, Louis Sachar touches many relevant issues: bullying, child abuse, racism, forgiveness and friendship being the most prominent. Three different stories spanning several generations are expertly woven into each other and neatly tucked in together at the end. Despite the realistic backdrop, the author chose a fairy-tale ending to his story, a bit disconcerting considering the issues presented. The book is a great read and understandably, a sure winner for younger readers.